On a recent trip to England, my wife ordered a bowl of baked avocados. They were covered in onions, peppers, and topped with cheese. As an avocado fan, I was immediately intrigued. I’ve always toyed with the idea of grilling avocados for guacamole, but it always struck me as a little gimmicky. This, on the other hand, is something perfectly adaptable for the grill. Better yet, It doesn’t require a plate, just a fork. It’s the perfect meal, even if it’s short on meat. 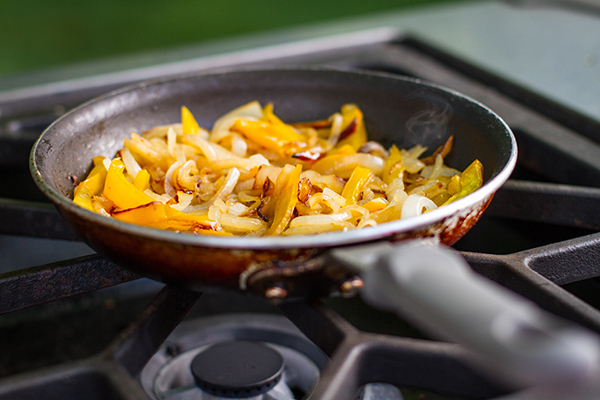 In a small skillet over low heat, add the butter and olive oil. Once the butter has melted, add the onion and pepper. Cook for approximately 20-25 minutes, stirring periodically. 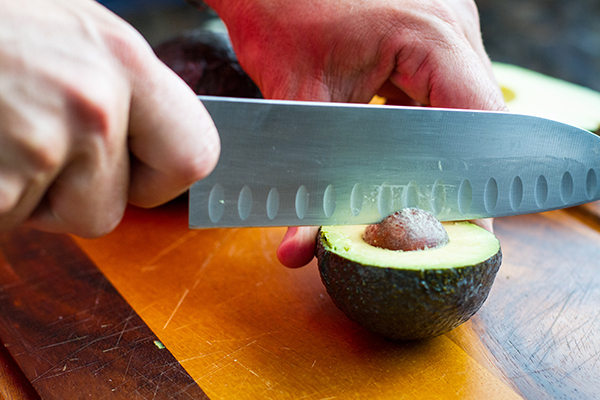 The key to slicing an avocado is to slice around its dense pit. 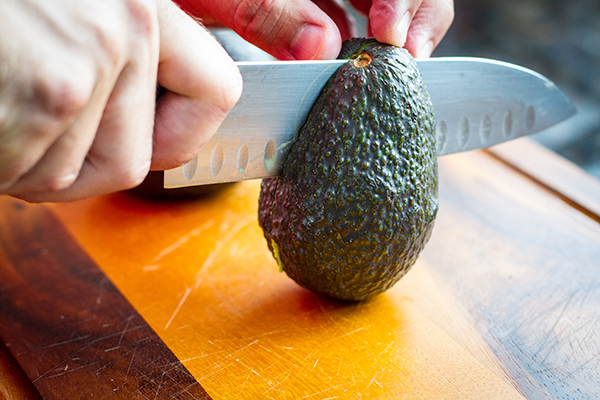 Place the avocado on a cutting board with the narrow end facing up. 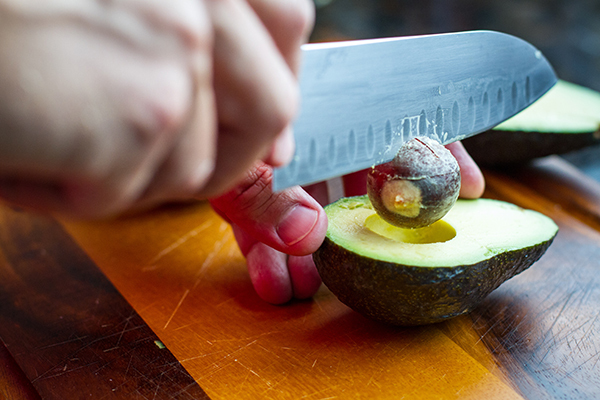 With a sharp knife, slice down the middle of the avocado until you hit the pit. 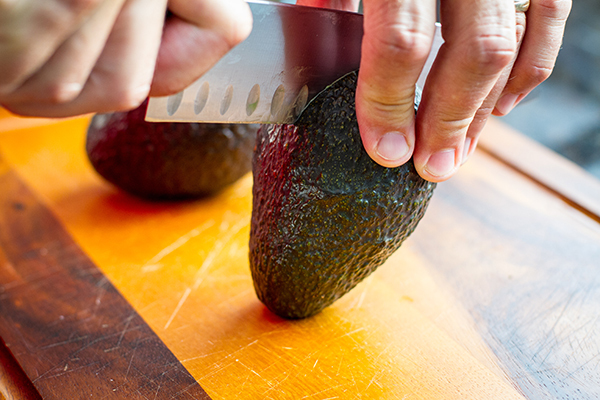 Rotate the avocado towards you and continue to cut down. Rotate the avocado again, you should come full circle. Continue to slice. 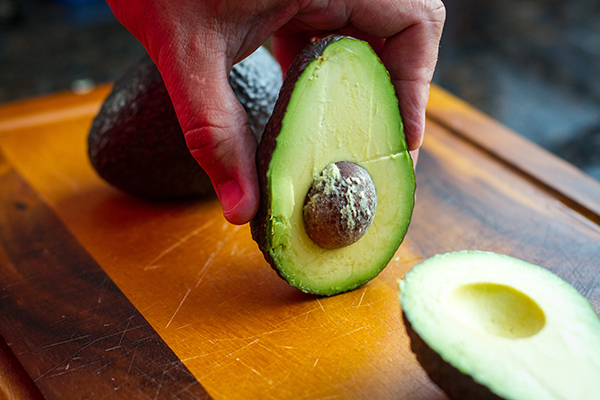 With the avocado sliced, take hold of both sides and twist. The sides should separate with the pit still lodged in one. Place the avocado slice with the pit skin side down. With a knife, strike the pit. It may take more than once for the knife to hold. 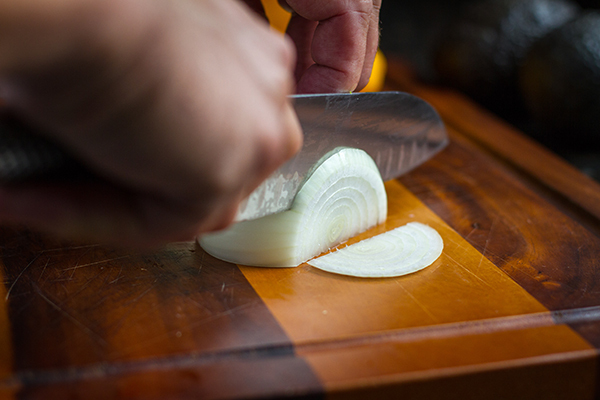 Once the knife is embedded in the pit, twist the pit to remove it. Discard. Mix together the cumin, salt, and pepper. 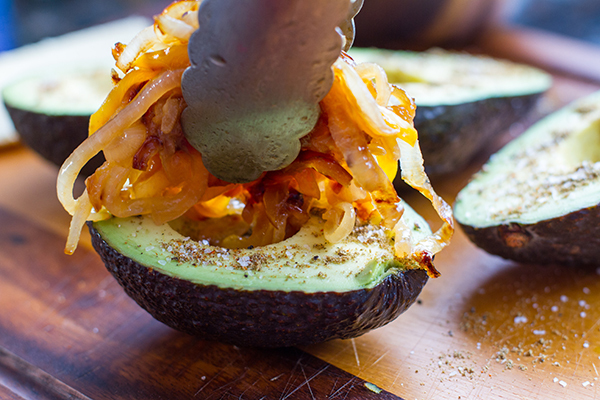 Sprinkle evenly over the avocado flesh. 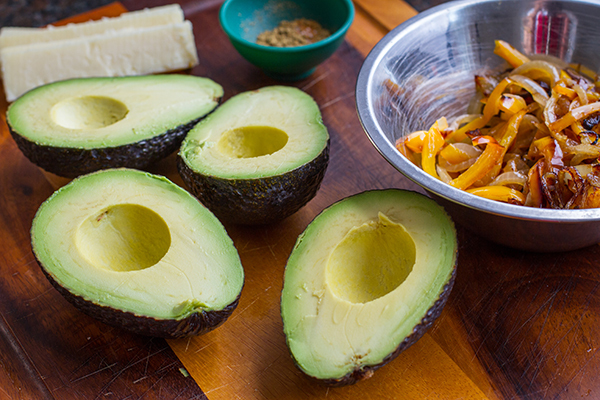 Add equal amounts of the onion/pepper mixture to the tops of the 4 avocados halves. 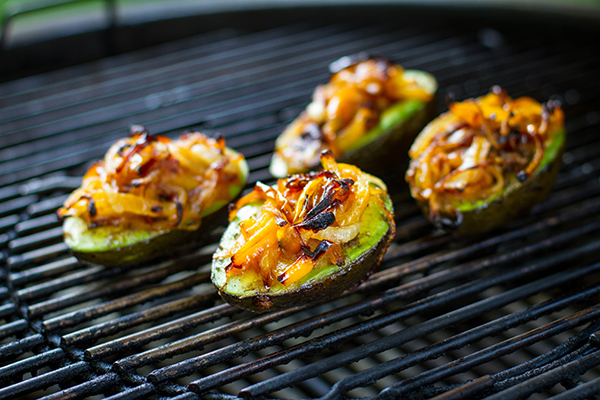 Grill the avocados over direct medium heat with the lid closed for approximately 20-25 minutes, until the avocado is soft when pressed. 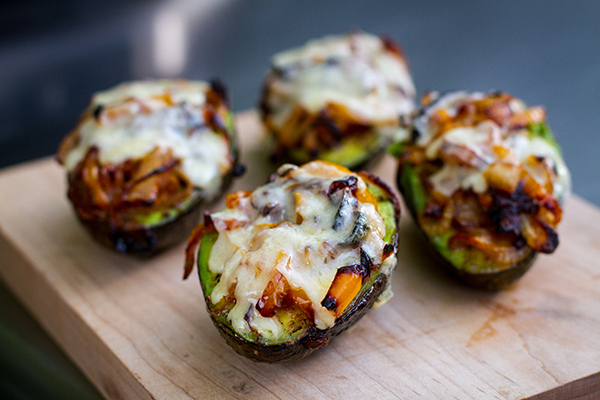 Add the cheese to each avocado, close the lid, and grill for another 5 minutes, or until the cheese has melted. Remove and serve.